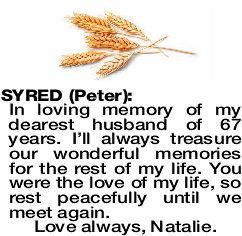 16.11.1925 - 22.3.2019 Dearly loved husband of Natalie for 67 years. Wonderful father and father-in-law of Phil and Serena, Tony and Anne, Murray (dec) and Cheryl, Joan and Tony. A treasured Grandfather of 10 and Great Grandfather of 14. A true gentleman now at rest. 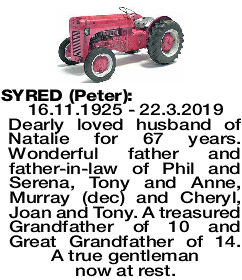 The Funeral Service for the late Peter Syred of Toodyay will be held in St Stephens Anglican Church Toodyay on THURSDAY (28.3.2019) at 1pm. A Burial will follow at the TOODYAY Cemetery. In loving memory of my dearest husband of 67 years. I'll always treasure our wonderful memories for the rest of my life. You were the love of my life, so rest peacefully until we meet again. Dearly loved father of Phil and adored father- in-law of Serena. 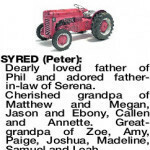 Cherished grandpa of Matthew and Megan, Jason and Ebony, Callen and Annette. Great- grandpa of Zoe, Amy, Paige, Joshua, Madeline, Samuel and Leah. Thank you Dad for your wisdom and guidance. The last of the old time Bolgart farmers. 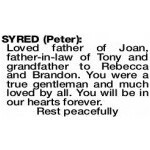 Loved father of Joan, father-in-law of Tony and grandfather to Rebecca and Brandon. You were a true gentleman and much loved by all. You will be in our hearts forever. 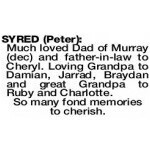 Much loved Dad of Murray (dec) and father-in-law to Cheryl. Loving Grandpa to Damian, Jarrad, Braydan and great Grandpa to Ruby and Charlotte. So many fond memories to cherish. 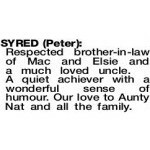 Respected brother-in-law of Mac and Elsie and a much loved uncle. A quiet achiever with a wonderful sense of humour. Our love to Aunty Nat and all the family. I appreciated your family's kindness when I was a child. 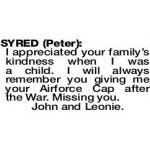 I will always remember you giving me your Airforce Cap after the War. Missing you. 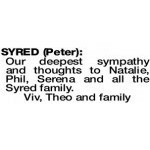 Our deepest sympathy and thoughts to Natalie, Phil, Serena and all the Syred family. 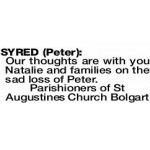 The Members of the Bolgart Golf Club wish to extend their deepest sympathy to Natalie, Phil, Serena and family on their sad loss. 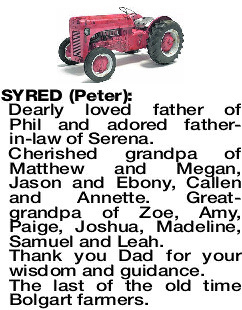 Heartfelt condolences to Natalie, Phil, Tony, Murray (dec), Joan and families on their loss of Peter. Committee and Members Bolgart Sports Club. Fond memories of a true gentleman. Great friend to Wilma and Ian. Our love to you Natalie, Phil, Tony, Joan and all your families. Reunited with Murray. Graeme and Sherrie. 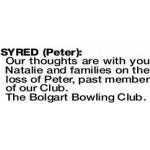 Our thoughts are with you Natalie and families on the loss of Peter, past member of our Club. 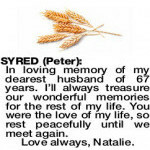 Our thoughts are with you Natalie and families on the sad loss of Peter.